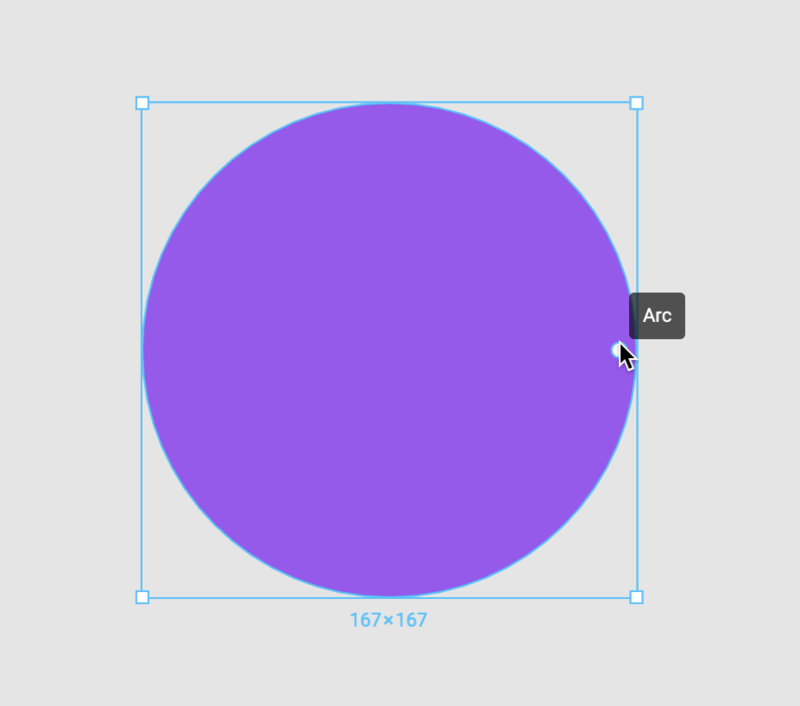 Draw a circle using the Ellipse tool. When you hover over the circle, a single handle will appear on the right-hand side. Click and drag the Arc handle up or down to change the Sweep. This create a gap in the circle. Tip! The tooltip will indicate the Sweep percentage. Dragging the handle up will produce a positive percentage, while dragging the handle down will indicate a negative percentage. The Sweep indicates how complete the circle is, shown by the percentage of the circle that is filled (as above). The Start handle (which has a dot inside it) indicates where the arc begins. The starting position of the handle is set to 0, but you can drag this around the circle to change the position of the ring. The Ratio handle at the center of the circle allows you to change the circle to a ring. By dragging the Ratio handle around, you can determine which segment is shown (either the gap or the remaining circle), as well as the size of the ring. Drag the Sweep handle to make a pie. Drag the Ratio handle to the desired size for the ring. Drag the Sweep handle back to meet the Start position, to close the ring.